MEDLEY OF IMAGES: "I enjoy the flexibility of my work, the way it fits into my life. I love people, meeting them and working directly with them." Photographer Robin Resch is enthusiastic about the variety of projects that have come her way - from portraits and weddings to documentary and product photography. Robin Resch is a talented photographer, whose work covers a wide spectrum. 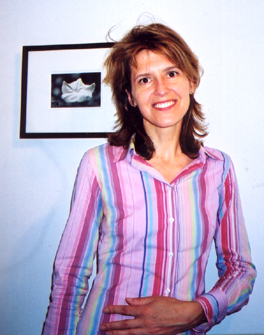 Her projects include portraits, flowers, weddings, products, and architectural photos. It has been seen in magazines, including Victoria magazine, and has taken her to Italy, New York, Maryland, and soon to Arizona. ALL DAY LONG: "A lot of people bring their newspaper to the cafe and read it over coffee. The cafe is popular all day long, with a big breakfast crowd, a great lunch business, and then people coming throughout the day." 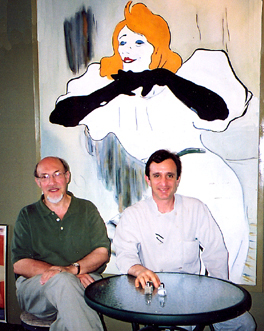 Bon Appetit's owner, Michel Lemmerling (left) and chef Alex Levine are shown in the store's popular cafe in front of a copy of a Toulouse-Lautrec painting, one of a variety of Great Masters copies that adorn the cafe's interior. Bon Appetit is going strong! Established in 1967 in Princeton Shopping Center by Carl and Virginia Andersen, it has been owned since 1989 by Michel Lemmerling, who will celebrate his 15th anniversary in August.